We help you pick the right hooks for storage racks. 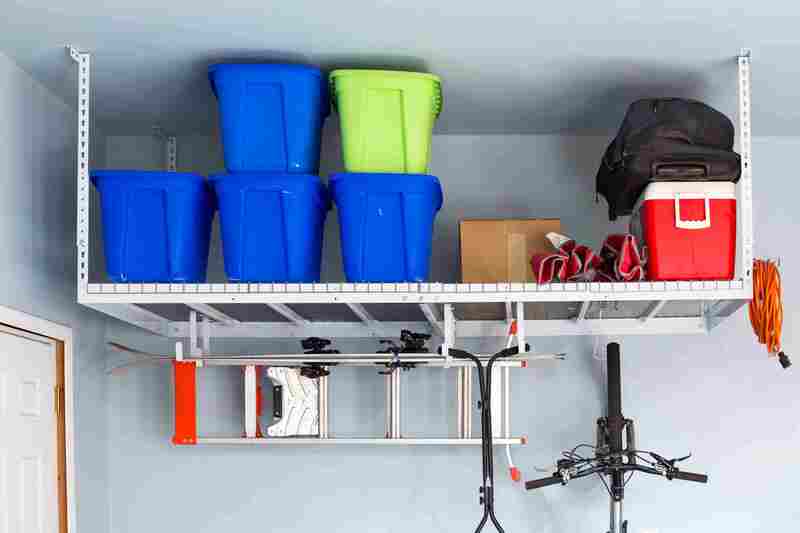 Hooks to hang a bike, ladder, skis or snowboard. Now all those loose items can be stored in once place. We sell 3 different types of hooks to help hang small items, long items like ladders and also hooks that hang from the side of the rack. When we install a rack for you we will show you which options may help you. Deciding what hooks for storage racks you want to add onto your overhead storage rack depends on several factors. Where the rack is being installed in the garage, at what height and what items you are storing. Of course you may not always need extra hooks for storage racks as already the 4ft by 8ft in size rack has plenty of space. However, many customers ask us about all the possible extras we can help them with. The ladder hook add on for example can also hold snowboards or skis. We will take the time to talk through with you about what will make sense for you and even show you how each set of hooks would work in your setting. We strive to make home storage easy, helping you work out what you need is a joy of our work.